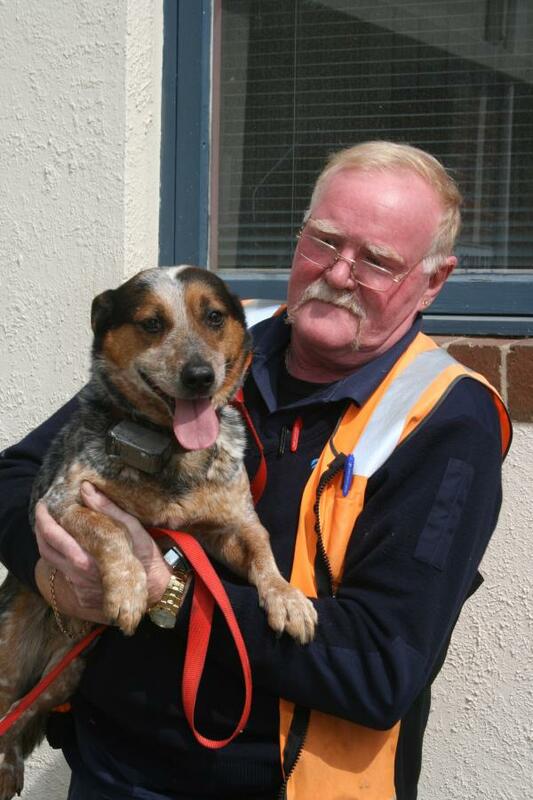 Worried commuters on Melbourne’s Westgate Freeway saw Jake the Blue Heeler dodging traffic this morning and called 3AW, who ran the story during their 8.05am traffic report. Twelve year old Maddie and mum Lisa heard the report as Maddie was on her way to school. "We could not believe it when we saw him trying to navigate the traffic," said Lisa. Leaping into action, Maddie, Lisa and other good samaritans came to Jake’s rescue, called in to 3AW and gave an accurate description of the lost dog and plead for his owner to come forward. Having heard the updates, The Lost Dogs’ Home General Manager Sue Conroy contacted 3AW to get Maddie and Lisa’s details so she could offer advice and help to find Jake’s owner. The Home arranged for an animal ambulance to collect a shaken Jake from Maddie and Lisa’s house. Brought back to the Home, Jake was scanned for a microchip and his owner Rex was called with the news that his dog was safe and sound at Gracie Street. Unaware of his four-legged friend’s escape, Rex was shocked at where Jake was found and relieved that people had taken the trouble to rescue him. Rex and Jake shared a happy reunion early this afternoon. "Thanks to Maddie and Lisa, plus other kind passers by, an accident involving Jake was averted. Wthout their actions, things could have ended up very differently for Jake. We are very happy that Jake had identification so he and Rex could be swiftly reunited." said Ms Conroy.